The goal of your website should be to turn readers into friends and friends into customers. You do this by writing about and engaging in conversations about real estate and getting people to contact you about buying or selling a home. You spend all of this time writing content for your website and promoting that content. You get traffic spikes here and there, yet still, it’s just not converting. You don’t look trustworthy. In less than 2 seconds, I’m going to decide whether I like you or not based on how your website looks. Yes, people really do judge a book by it’s cover in this respect. If your site is riddled with stock photography, poor copy, little contact info about the author and blatant sales pitches, it looks less than trustworthy. Great design speaks volumes. It captures people’s attention because it stands out. But it also makes people feel good about engaging with you because it says you’re a professional. Not talking to your right customer. Truth is, you’re going to attract the audience that you write for. So if you write content for buyers, you’ll attract buyers. If you write for sellers, you’ll attract sellers. If you’re content is consistently off-topic and all over the place, you’ll attract low quality traffic that doesn’t convert. Your customer is confused. Take a quick look at your website, then ask yourself, is my website clutter killing my customers? In other words, how easy is it to find the information they’re looking for? Is your navigation cluttered and messy? Can I quickly and easily search for homes? The easier it is to navigate, the better. If it’s difficult, I’m gone. And just like that, you’ve lost another customer. No Call To Action! You have these great community landing pages, but there’s one tiny little problem… You don’t have any specific Calls To Action on those pages. Nothing that tells the reader what to do should they have any questions about the neighborhood or about a specific property. Call? Email? Submit a form? Tell me what to do next! No proof. Help people visualize the benefit of working with you. Do this by showcasing testimonials from other clients that share their specific experience in working with you. Why were you a pleasure to work with? How did you help them feel secure about buying their first home? You’re using your website to try and attract, engage and convert new clients. Push them gently towards making a connection and engaging in a conversation with you by helping them visualize just how good an agent you are – you do this by letting past clients speak for you. 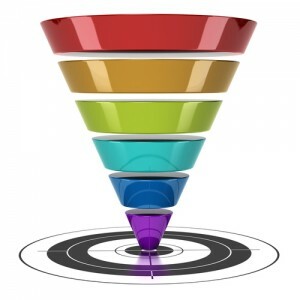 Your conversion funnel should be simple… Write engaging content that attracts an audience (the right audience) >> Tell them what to do next >> Convince them with great design, great writing, and by using trust-cues like customer testimonials. What other mistakes do people make that wreck their conversions? What else can they do to better position themselves to attract and convert higher quality traffic?